On the first of May 1539, Isabella of Portugal died. Isabella, the wife of the Emperor Charles V, the most powerful monarch in Europe, succumbed to fever after giving birth; the child also failed to survive. In an age of dynastic alliances that paid scant heed to the feelings of those involved, the Imperial marriage was unusual in being marked by real affection from the outset, so Charles felt the loss of Isabella particularly keenly. He put aside affairs of state and for a period withdrew to a monastery. Whilst in retreat he wrote to his brother, the Archduke Ferdinand, saying that ‘he had nothing left to do but to submit himself in all patience to God’s will, and pray him to take Isabella to him in Paradise’. One mark of Charles’s continuing affection for his wife was the commission from the artist Titian of a number of posthumous portraits, but Charles’s hope that it would be the divine will for his salvation and heavenly reunion with Isabella is most vividly displayed in Titian’s Gloria, showing the Imperial couple worshipping the Trinity, the patron of the Empire. Charles prized this and his portraits of Isabella so highly that they were among the few paintings that he took into his final retirement at the monastery of Yuste in 1556. The devotion Charles exhibited towards the memory of his beloved wife found expression not just through visual depictions but in music, too, in a number of works by Thomas Crecquillon. Virtually nothing is known for certain of this composer outside the period of his Imperial service from 1540 to 1550, and little enough even about that. He is known to have been chapel master from 1540, probably until 1545, when the burden of composition seems to have taken over and Cornelius Canis assumed the more routine tasks of running the choir. However little we now know, his music was very widely printed and copied; it reached virtually the whole of Europe and even the New World. Works of his were used as models for new compositions and are found in arrangements by a good number of later composers (Monteverdi, no less, regarded him as one of the great masters of the sixteenth-century style). That wider fame was matched by the regard in which Charles evidently held his music: the Court poet recorded how the Emperor was particularly moved by Crecquillon’s work, and called him ‘the truest Orpheus of our age’. Just as Charles turned to Titian as a leading artist of the day for commissions, the list of Crecquillon’s state motets, Masses and chansons show that he was Charles’s choice for the composition of music for the great occasions within the Court and beyond. 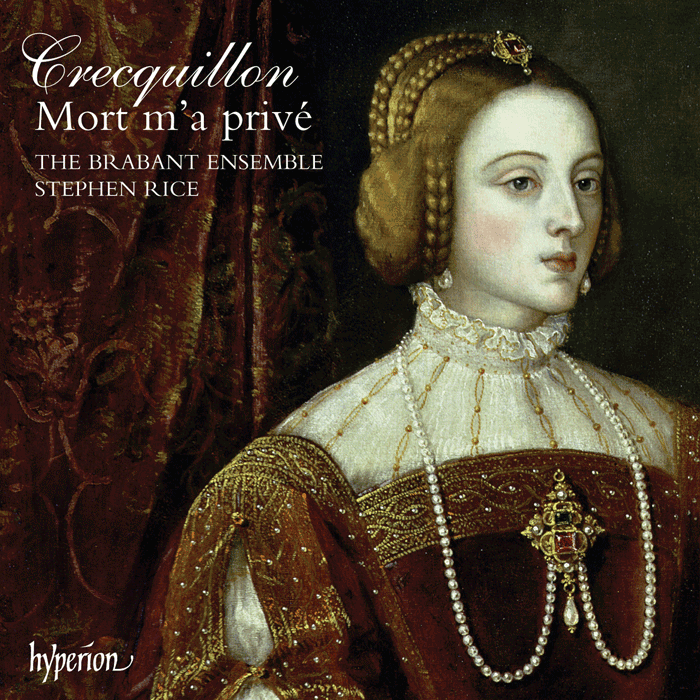 The first works in the group of pieces related to the Empress Isabella are the two chansons Mort m’a privé. The text that Crecquillon set is highly unusual: it is one that speaks of loss in very personal terms rather than in the conventionalities of the day. The emphasis in this text on patience and submission to God’s will precisely mirrors Charles’s letter to his brother following Isabella’s death. The reference to ‘great ancestry’ fits Charles well too: his family tree was littered with Biblical Patriarchs, minor saints and mythological figures; Charles’s reliance on Isabella as a confidante and his distraught reaction to her death are also reflected in this verse. The whole stanza seems to have been written specifically to reflect his state of mind after Isabella’s death—he himself may even have penned it, although we cannot be sure. Crecquillon’s two settings of this text in themselves seem designed to be emblematic of the Imperial couple, the five-voice setting representing Charles and the four-voice one Isabella. These settings are in different modes, something that would have carried a particular resonance in itself at the time but which is difficult for the modern listener to recapture—the mode for Charles’s version would have had overtones of homage and respect, whilst that for Isabella would have carried intimations of sorrow and loss; the difference in the number of voices also speaks of the respective difference in status. Despite the difference of mode, there is a very subtle musical link between the two works, significantly in the setting of the words ‘divine will’. The bass, or ‘ground’, in this fragment of music in the five-voice version is the same as the uppermost voice carrying the same words in the other setting, suggesting that Isabella was the ground of Charles’s happiness. The Mass setting itself is based largely on the five-voice chanson, a common compositional technique of the period. Within the Habsburg court, the knowledge of the chanson and the meaning of its text would have given point enough to the Mass, but Crecquillon’s symbolic construction is considerably more complex than that. He uses material not only from his chanson model, but also from the four-voice one, as well as making allusion to the two other chansons that are included here. More than that, the ‘divine will’ portion of the main chanson model is reserved for a limited number of points within the Mass, and where it is not inherently prominent—for instance in opening a musical section—it is clearly signposted by changes of texture. Similarly, it is the corresponding ‘divine will’ fragment of the four-voice work that Crecquillon incorporates into the Mass. These fragments and the additional material from the remaining chansons here are disposed in ways that provide a commentary on Charles. There are even three references to the Persons of the Trinity, a musical analogue to the object of Isabella and Charles’s adoration depicted in Titian’s painting. The listener may hear, in the very opening section of the work, the Kyrie, a small portion of the chanson Oeil esgaré. The text of this chanson has a dark hue in bemoaning the loss of a look, a glance which is desperately sought but which cannot be found, although it is less certain whether this text, like that of Mort m’a privé, was written specifically for Charles. The portion of music borrowed is from the last line of the chanson so that the two texts together effectively say: ‘Lord, have mercy and rescue his [Charles’s] heart from pain and torment.’ This sets out the consolatory intention of the Mass as a whole. The second section of the Kyrie prominently twins the two ‘divine will’ fragments to ask more specifically that it should be the divine will to have mercy on both Charles and Isabella. Other particularly audible examples of such conjunctions may be heard in the Credo. At the ‘incarnatus’, parts of both ‘divine will’ fragments, one in long note values, are combined to reinforce the belief in the divine essence of the Royal couple. Then, at the words ‘Et expecto resurrectionem mortuorum’ (‘And I look for the resurrection of the dead’), Isabella’s ‘divine will’ fragment is clearly heard, with an upward transposition, illustrating Isabella’s hoped-for rising. This is immediately followed by Charles’s ‘divine will’ fragment, prominent in setting the final words: ‘et vitam venturi saeculi’ (‘and the life of the world to come’). Similar symbolism runs through the Sanctus and Benedictus. The Hosanna section uses both fragments, expressing the hope that both Charles and Isabella would so praise God in Heaven with the Heavenly hosts—yet another echo of Titian’s Gloria. The Benedictus was commonly associated with the divine element of kingship and again Isabella’s fragment can be heard in the opening of the section, emphasizing, like the ‘incarnatus’ of the Credo, that Isabella is a focus of the work. Perhaps more importantly, though, this is the moment most closely linked to the central mystery of faith, the moment when the sacrifice of the Mass is effective, benefiting not just the living, but the dead whose sins are yet to be fully expiated. It is no coincidence that Charles’s daily private said Mass was for Isabella. This Mass too was for Isabella’s soul as the musical reference here makes clear once more. The final section of the Mass, the Agnus Dei, contains the second of Crecquillon’s quotations from other chansons, from a very sardonic comment on the world: Le monde est tel. The movement opens with the ‘standard’ material, but this soon gives way to the additional quotation, a substantial portion from the music for the last line of text of Le monde. Once again, the significance is in the conjunction of the words of the Mass and those of the borrowed music. The Agnus Dei asks for mercy and peace and the borrowed chanson text adds, in effect, ‘or never will he [Charles] profit otherwise’. This Mass section ends with the most sustained, and musically quite insistent, use of Charles’s ‘divine will’ quotation, suggesting first that the mercy and peace prayed for are the gifts willed by God to those who believe and trust, and second, the urgency of that plea for such relief. Having prayed for Isabella so clearly, this remarkably complex musical testament to Charles’s devotion to his dead wife ends, as it began, with a prayer for consolation and comfort for Charles himself. In addition to these works so personal to the Emperor, Crecquillon is known to have written three funerary motets for others within the Imperial circle. Cur Fernande pater is for Elizabeth of Poland, the Emperor Charles’s niece and a particular favourite of his. She had married Sigismund, King of Poland, in 1543; her leaving of the Habsburg courts had been marked with the gift of a chanson and a Mass based upon it, both by Crecquillon. Elizabeth died in 1545, possibly poisoned—the victim of intrigue in the Polish court, it was rumoured. Charles and the Archduke Ferdinand, her father, were together when the news reached them. A few days later, formal obsequies were held, attended by representatives from a number of different countries as well as by Elizabeth’s family. Again, Crecquillon was called on to provide suitable music and, despite the pedestrian text with which he had to work and the limited time, he produced a work that conveys the very real emotion that Elizabeth’s family must have felt. The remaining two funeral motets are perhaps less personal, more formal state works. They celebrate generals. Praemia pro validis was written for the funeral of Maximilian of Buren in 1548. Maximilian, a hard-living and hard-drinking soldier, had been close to the Emperor through many of Charles’s military campaigns. He met his death with so much enthusiasm in his leave-taking that it became the stuff of literature. Caesaris auspiciis does not give a name, but the record of the unknown general’s military service and the closeness to the Imperial circle that he must have had suggest that it was written for Philippe de Croy, Duke of Arschot and Governor of Hainault, who died in 1549.